Jacob Hopper celebrates after the GIANTS beat Geelong in Geelong for the first time. It's a bit different having a pre-season and feeling good heading into a year, and not having to try and convince myself that I'm fit and I've got the work under my belt. Jacob Hopper's uninterrupted pre-season has the young GIANT confident he can take on more responsibility in a midfield set to be without Callan Ward for the season. Everything's Bigger Up Close in the nation's capital. Don't miss the GIANTS live at UNSW Canberra Oval. Sign up as an ACT Member today. 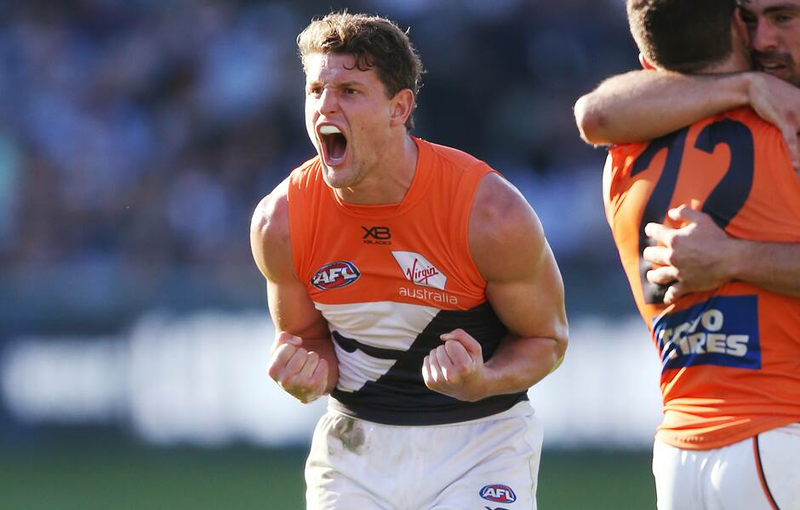 He gathered 31 in the GIANTS' comeback win over Geelong on Saturday at GMHBA Stadium, and stepped up with his team missing co-captain Ward for almost all of the contest after going down with a knee injury early in the first time. "I've had so many hiccups and injuries along the way. Last year was a good year where I got some rhythm, but I still didn't really have a pre-season before that," he told AFL.com.au. "It's a bit different having a pre-season and feeling good heading into a year, and not having to try and convince myself that I'm fit and I've got the work under my belt. "In the past I was almost trying to trick myself that I'd done the work and I'd done a pre-season when I probably had only done a maximum of 20 per cent of the work. It was good having full faith in my body and knowing I have the work under belt and that I can give it my all." The GIANTS overcame Ward's absence against Geelong to set up their season at 3-1 ahead of Saturday's clash against Fremantle in Canberra. "We saw him on the bench as well and he was in all sorts, so having someone like that, especially someone as loved as 'Wardy', it's something that really galvanised the group," Hopper said. "Obviously there's some more responsibility in the midfield and the more minutes I can get in there, I just love to get amongst it." Hopper, was drafted to the club via the GIANTS' Academy in 2015, said his management are in discussions for a new deal. "I love the club and we're in some really good talks with the club at the minute. I'm really settled in Sydney now and I'm feeling good about the situation," he said. "Sydney's a great place and I'm really settled in now. It's my fourth year now so I've got that comfortability amongst the group, made some really good relationships and we've got really strong connections."